The biodiversity economy is based on South Africa’s rich biological diversity that constitutes 7% of the world’s plant and mammal species and comprises of three focus areas, namely bioprospecting, wildlife and ecotourism. These three subsectors all entail activities that are supportive of sustainable utilisation, community beneficiation, economic development and transformation. The sector is also well-poised to operate in the far flung rural and peri-urban areas as genetic resources naturally occur there. Biodiversity economy is poised to immensely contribute to rural development and ,thus, mainstreaming marginal communities, women and youth to meaningfully contribute to the growth of the economy of the country. In addition, the entry requirements for the sectors are relatively low and community participation is easily facilitated through existing community governance structures. 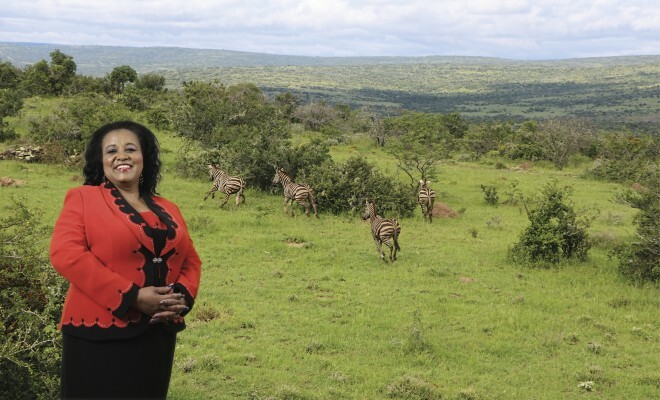 Since assuming her role as Minister of Environmental Affairs, Molewa has worked to advance the integrated strategic management of rhinoceros through a variety of conservation-minded efforts approved by the President’s Cabinet. Among these efforts are translocation programmes, anti-poaching initiatives, the sale of rhinoceros to private properties, law enforcement collaboration at all levels and to conform to CITES Regulations on detecting trafficked flora and fauna. Her input is evident from the growth shown by the South African biodiversity economy in recent years. This increasingly important economic sector, which focuses on the development and transformation of the wildlife, bio-trade and eco-tourism industries, is a key contributor to job creation. “When Nelson Mandela was released from prison in 1990, it symbolised the many steps the country was yet to take in its quest to move to a new era of sustainable development. Mandela’s release further symbolised the emergence of a paradigm , as a nation and a people, there is recognition that development should benefit all South Africans, whilst not depriving future generations the access to the same resources and natural assets,” says Minister Molewa. To many people, ‘biodiversity’ is a misunderstood concept. In simple terms, biodiversity is all the plants and animals that we have, as well as their interactions and the differences between them. These interactions, which also include human beings, provide us with a number of essential natural services that we call ecosystem services. These services include food production, material for shelter, clean air and water, medicines, as well as places for healing and enjoyment. Moreover, the ecosystem services that are derived from biodiversity are considered alongside its potential to yield economic benefits, contributing towards improving livelihoods and creating employment. These are the foundation of human well-being and as industries in the hunting sector and bio-trade also indicate, a vital source of many of our livelihoods. She says, “The biodiversity economy of South Africa encompasses the businesses and economic activities that either directly depend on biodiversity for their core business or that contribute to the conservation of biodiversity through their activities. The biodiversity economy of South Africa is largely anchored on three pillars, namely bioprospecting, wildlife and eco-tourism industries, which all notably contribute to the country’s economy. South Africa has come a long way with regard to addressing the triple challenges of unemployment, poverty and inequality. The government continues to work together with stakeholders to implement innovative approaches that can easily be adopted and translated into local economic development opportunities. The transformation of the biodiversity sector, in particular, is a necessity in a changing world. This is more so in the context of South Africa, where policies of the past were exclusionary, thus, depriving the majority of citizens of the opportunity to actively participate in sectors of the economy. It can’t be justified that the custodians of the genetic resources and, equally, the holders of the traditional knowledge are treated as non-equals in the beneficiation of their resources. In response to this anomaly, the government has developed and implemented the National Biodiversity Economy Strategy, which promotes a new generation of partnerships between communities, industry and the public sector. Minister Molewa continues, “As a strategic tool to address the challenges and achieve the anticipated sustainable advancement of the wildlife and bioprospecting/bio-trade industries, the Department of Environmental Affairs has developed the Biodiversity Economy Strategy (BES). This is a 14-year strategy for the wildlife and bioprospecting sector that will guide the sustainable growth and provide a basis for addressing the constraints to the growth of both sectors. “The vision of the BES is to optimise the total economic benefits of the wildlife and bioprospecting industries through its sustainable use, in line with the vision of the Department of Environmental Affairs. The BES was developed with the purpose of providing a 14-year national coordination, leadership and guidance to the development and growth of the biodiversity economy. This was an intense process, which focused on identifying quantifiable targets centred on transformation, sustainability and economic growth, as well as the associated initiatives meant to deliver big, fast results for the bioprospecting, wildlife and coastal and marine tourism subsectors. Among the outcomes of the Biodiversity Economy Lab held in 2016 were 15 key initiatives identified in the wildlife sector, which aimed at delivering a thriving and inclusive wildlife economy for the benefit of all South Africans. This included the identification and prioritisation of land for transformation, operationalisation of biodiversity economy nodes, capacity building for community structures and unlocking the economic potential of protected areas. “The aspiration for Operations Phakisa: Biodiversity Economy is to create an additional 100 000 new jobs in an inclusive, sustainable and responsive wildlife economy, growing at 10% p.a until at least 2030. Furthermore, it was estimated the bioprospecting industry would create a sustainable, inclusive and commercially viable sector adding 10 000 new jobs from the current 6 200 jobs and contributing R1.7-billion to GDP at 10% p.a by 2030. Vast opportunities were identified in the ecotourism space where protected areas could be unlocked to create job opportunities for local communities and small and medium enterprises. “This commitment spelt out in the National Biodiversity Economy Strategy (NBES), was confirmed by delegates to the recent Biodiversity Economy Indaba in East London. “Wildlife ranching or game farming in South Africa encompasses more than 9 000 wildlife ranches, mostly privately owned and managed. Besides contributing to the growth in GDP and creating job opportunities, this sector remains largely untransformed,” she adds. Bioprospecting and bio-trade activities have supported local livelihoods through the sustainable utilisation of indigenous biological resources as informed by the associated local traditional knowledge. Since then, there has been a steady growth of the bioprospecting industry in the country, driven by the increase in the demand for indigenous plants by various industries. The Tyhefu community, under the Tyhefu Traditional Council in the Peddie area of the Eastern Cape Province of South Africa, harvests sap from Aloe ferox plants from an area of approximately 50 000 hectares. The Aloe ferox harvesting project involves predominantly women and youth from the community. “The contribution of the utilisation of Aloe ferox to the livelihoods of the community of Tyhefu extends far beyond the people who are actively involved in the aloe harvesting. The project has been critical in sustaining local livelihoods for a rural community, which has lived in a high unemployment area,” remarks the minister proudly. “This is an important community development project with significant potential. There has been a marked increase in income levels to a point where people have adequate food, have moved out of extreme poverty and are able to pay for a minimum basket of non-food items, including clothes, housing and school fees for children,” she adds. The 3rd Biodiversity Economy Indaba provided an apt platform to small, medium and micro enterprises to link up with potential investors. This was part of the department’s contribution to the broader transformation agenda that underpins the resolve for a radical socio-economic transformation. In 2016, the Department of Environmental Affairs and the Department of Tourism co-hosted a Biodiversity Delivery Lab to develop an implementation plan for the National Biodiversity Economy Strategy adopted in 2015. The Lab’s aspirations were centred on transformation, sector sustainability and economic growth. In the process, the wildlife and biodiversity/bio-trade work streams were able to prioritise issues that would move the respective sectors forward within the next three years. Collaboration is required at a local, regional and international level to respond meaningfully to the challenges posed by market forces. Therefore, there is a need to intensify the investments in research and innovation in order to firm up capabilities for value addition and beneficiation, from plants in the agro-processing sector and improving the quality of local products. “Through the inclusion of eco-tourism in the development of the biodiversity economy, it is hoped the economic activities in this subsector will expand. This includes hiking the number of people visiting pristine and relatively undisturbed natural areas. This is a sector that is intended as a low-impact and often small-scale alternative to standard commercial mass tourism. This, in turn, contributes to community upliftment. 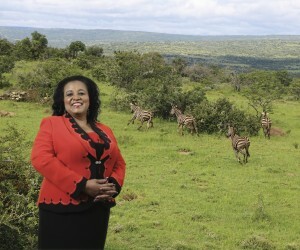 “The NBES provides the opportunity to develop the rural economy of the country while addressing environmental imperatives of the government and includes the establishment of a National Bios Prospecting Forum to enhance development in the natural ingredients sector, launched during the indaba,” says Minister Molewa. During the indaba, the government, investors and industry stakeholders from the wildlife, bioprospecting, bio-trade and eco-tourism sectors pledged their commitment to the development and economic growth of a sector of South Africa’s economy that has the potential to become one of the largest contributors to the country’s GDP. One of the commitments made in the three streams was to ensure that the transformation of the biodiversity sectors happens post-haste. “Within the wildlife economy, there has been an undertaking to create a conducive environment for a fast-tracked transformation, as well as to address legislative hindrances through the harmonisation of national and provincial legislation, the centralisation of the permitting system and fast-tracking legislative processes in order to allow transformation. Meaningful community participation in this sector of the economy, alongside the encouragement of partnerships and investment, is key to a successful wildlife industry in South Africa. “Within the bioprospecting sector, efforts are underway to fast-track the finalisation and operationalisation of the Bio Products Advancement Network South Africa (BioPANZA) by 2019. Amendments to the National Environmental Management: Biodiversity Act and the Bioprospecting and Benefit-Sharing (BABS) Regulations are to be finalised, while the SADC Secretariat is called on to organise a formal regional preparatory meeting towards the COP-MOP3 for the Nagoya Protocol in Egypt later this year. A transactional advisory committee will also look into indigenous biological/genetic resource value in order to create appropriate provisions to promote fair and equitable beneficiation within this important sector in the economy,” says Minister Molewa. Investors are being encouraged to assist in the expansion of the eco-tourism sector through investment, not only in developing enterprises, but also in the development of skills. Within eco-tourism, there is also a need to capitalise on the integration of land use to develop strong linkages between tourism and other economic sectors. “The Department of Environmental Affairs is dealing with dynamics that require a clear understanding of the global political economy. There is a need for collaborative efforts at various scales of local, regional and international levels to respond meaningfully to the challenges posed by market forces. Thus, the need to intensify investments in research and innovation in order to firm up capabilities for value addition and beneficiation from plants in the agro-processing sector and improving the quality of local products,” she reflects. Among the outcomes of the Biodiversity Economy Lab were that 15 key initiatives be identified in the wildlife sector that could deliver a thriving and inclusive wildlife economy for the benefit of all South Africans. This included the identification and prioritisation of 10 million hectares for the transformation of the wildlife economy; the establishment, development and support of new wildlife ranching entrants; operationalising 11 biodiversity economy nodes countrywide and formalising the game meat market and creating a network of 110 game meat processing facilities, which are black-owned. It was also decided that steps would be taken to unlock the potential of protected areas and capacitating organised community structures such as communal property associations (CPAs) and trusts. A significant amount of work has been done towards achieving the targets set out in the Biodiversity Economy Lab. As a result of this, the wildlife economy has created over 782 jobs and has donated over 768 heads of game as part of the transformation through various wildlife economy projects nationally. To date, the wildlife economy has secured R138 million in private sector investment. In addition to this, the government (through EPIP funding) has invested a further R66.6-million in the wildlife economy sector. In addition, and as part of training interventions, the Department of Environmental Affairs has trained 25 community property associations and a total of 587 people have been capacitated in the form of workshops, training and youth programmes. Access and Benefit-Sharing permitting system and amending environmental legislation to align it to the protection of the rights of traditional knowledge holders, and to align it to the Nagoya Protocol on Access and Benefit-Sharing. The Lab had also identified the need to establish a BioPANZA to harness existing initiatives and to address the innovation chasm,” says the minister. To date, the bioprospecting economy has received US$4 974 000 million in investment and has further secured an expected total investment of R465 232 822.89 million from the Department of Environmental Affairs. The department has further developed a baseline study on cultivation in the regulated sector and, currently, 294.52 hectares have been cultivated. “The department is in the process of establishing a Northern Cape bioprospecting research and development (R&D) hub at Die Eiland Experimental Farm that will see the development of an R&D plan, which will propagate Devil’s Claw and related seedlings for sale/supply for community project cultivation as well as offer agro-processing support services and supply material for clinical trials. “It is hoped that the Biodiversity Economy Indaba would become a one-stop platform for those seeking biodiversity economy business ventures, meeting traditional knowledge (TK) holders and genetic resource stockholders, as well as public sector regulating bodies in order to grow trade and investment in the sector,” she reflects. Biodiversity has globally been identified as the cornerstone of economic growth and sustainable development. As one of the mega-biological diverse countries, South Africa has posed a challenge to itself to establish mechanisms in which its biodiversity can be sustainably used to contribute towards addressing the vicious circle of the three economic ills facing the country i.e. unemployment, poverty and inequality. In 2017, the Khomani San community in the Northern Cape received a donation of game from SANParks to mark their entry into the wildlife economy. In 1999, some 40 000 hectares of land was handed back to the San community. It was a victory that allowed the community to resettle on the land within the Transfrontier Park and which, in 2002, saw additional land being reproclaimed as a contract national park. Following the successful land restitution claim of the Khomani San and the Mier communities, the signing of the !Ae!Hai Kalahari Heritage Park Agreement with the South African National Parks (SANParks) in 2002 marked the beginning of a relationship between the community and SANParks that could serve as an example of cooperative governance to communities in conservation across South Africa. The agreement saw land restored to the communities that had once roamed or farmed the Kgalagadi Transfrontier Park (KTP). The settlement is in line with the government’s programme to ensure an equitable redress for communities that have launched land claims on national and provincial parks. The minister went on to talk about the department’s fight against poaching, which is always an issue due to the incredible demand from Asia. “As you will know, rhino poaching is a national priority crime; and the Department of Environmental Affairs continues to follow a multi-disciplinary approach together with our colleagues in the justice, crime prevention and security cluster departments and agencies, namely, the Departments of Defence, Justice and Constitutional Development, Correctional Services, the Ministry of State Security, the Directorate of Priority Crime Investigation or Hawks and the South African Police Service (SAPS). “SANParks, the South African Revenue Service (SARS), the Asset Forfeiture Unit and National Prosecuting Authority and all our provincial conservation authorities also continue to provide the necessary support required in this endeavour. We remain committed to providing timely and comprehensive reports on the state of rhino poaching in South Africa,” concludes the minister.